The Gif Animator features of the Gif Recorder software are divided over its two programs, the Gif Screen Recorder and the Animated Gif Editor. 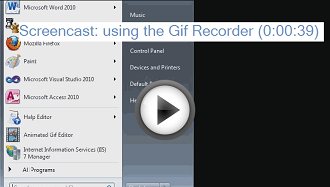 The Gif Screen Recorder is an easy to use screen recorder making a screencast in the animated gif format. By using the best available algorithm the recordings get near photo quality. Only storing the differences during recording results in a maximally compressed gif with small file size. Area presets simplify setting the correct recording area. You can pause a recording to skip actions which are to be left out of the screencast. Time lapse recording can be set allowing a longer time period to be represented by a small screencast resulting in smaller file size. 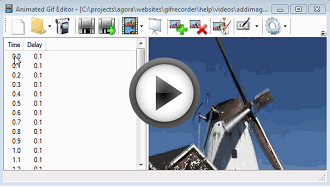 Use the Gif Recorder to convert a screencast (Flash, AVI, Mpeg,...) to the Gif format. The Gif Animator Editor can be used to work on both screencasts and traditional manually created gif animations. The editor has many features of which the below are the most important. Add subtitles to a gif animation - an important feature when making tutorials. The ability to resize a gif. Generate HTML pages with start and stop code. This gives the user control over when to start the Gif. Convert to AVI for publication on YouTube.